aFrom the Russell H. Morgan Department of Radiology and Radiological Science, Johns Hopkins Hospital, Baltimore, Maryland. SUMMARY: With advancement in 3D imaging, better fat-suppression techniques, and superior coil designs for MR imaging and the increasing availability and use of 3T magnets, the visualization of the complexity of the brachial plexus has become facile. The relevant imaging findings are described for normal and pathologic conditions of the brachial plexus. These radiologic findings are supported by clinical and/or EMG/surgical data, and corresponding high-resolution MR neurography images are illustrated. Because the brachial plexus can be affected by a plethora of pathologies, resulting in often serious and disabling complications, a better radiologic insight has great potential in aiding physicians in rendering superior services to patients. The brachial plexus is a network of nerve confluences and ramifications, which combine to form the large terminal branches that supply motor and sensory branches to the upper extremities. The clinical differentiation of brachial plexopathy from other spine-related abnormalities often poses a considerable diagnostic challenge, and electrodiagnostic tests are difficult to perform due to the deep location of the plexus, often leading to indeterminate results. MRN has been increasingly used in recent years to further evaluate cases of suspected or established brachial plexopathy and peripheral neuropathy, with excellent results.1⇓⇓–4 This article illustrates the relevant anatomy and the various common pathologies of the brachial plexus and describes the respective imaging findings at 3T MR neurography, with emphasis on 3D imaging. The C5 and C6 nerve roots compose the upper trunk, C7 continues as the middle trunk, and C8 and T1 compose the lower trunk. The 3 trunks are formed within the interscalene triangle. The suprascapular nerve (C5 and C6) and the nerve to the subclavius arise from the superior trunk. The phrenic nerve (C3-C5) passes between the anterior and middle scalene and continues over the surface of the anterior scalene muscle. More laterally, the trunks ramify into the 3 anterior and 3 posterior divisions, which join to form 3 cords distal to the lateral margin of the first rib. The cords are the lateral, posterior, and medial cords, based on their relationship to the axillary artery. The lateral cord is formed by the anterior divisions of the upper and middle trunks and gives off the lateral pectoral nerve (C5-C7) and contributes to the median and the musculocutaneous nerves. The posterior divisions of all the trunks form the posterior cord, which gives off the subscapular nerves. The inferior trunk continues as the medial cord and gives off the median pectoral nerve (C8, T1), the medial brachial cutaneous nerve (T1), and the medial antebrachial cutaneous nerve (C8, T1). The cords end in 5 terminal branches: the median, ulnar, musculocutaneous, axillary, and radial nerves. The respective anatomy and regional lesions of these nerves will be discussed in the last section of the article. Brachial plexus lesions can be prudently classified according to their location in relation to the clavicle, as supraclavicular, retroclavicular, and infraclavicular lesions. Less commonly, panplexus lesions may result from severe trauma or radiation neuropathy. Retroclavicular lesions involve the brachial plexus divisions. Generally, anterior division lesions lead to flexor compartment pathology, and posterior division lesions lead to extensor compartment pathology. Isolated lesions in the divisions are rare; therefore, for practical purposes, these are included in the infraclavicular pathology. Infraclavicular lesions affect the cords and terminal branch nerves, and these are approximately 3 times less commonly seen than the supraclavicular lesions. These lesions also generally have better prognosis and earlier recovery than the supraclavicular lesions. Common causes include radiation neuropathy, humeral fracture-dislocation, gunshot injury, and iatrogenic injuries. Lateral cord lesions cause weakness in elbow/wrist flexion and forearm pronation with sensory loss in the anterolateral forearm and hand. Medial cord lesions produce similar symptoms with relative sparing of the finger extensors. Posterior cord lesions affect the radial and axillary nerves, causing weak arm, wrist, and finger extension and sensory loss over the shoulder and posterior arm. The MRN technique used in our institution has been outlined in the Table. Although MRN can be performed at lower field strengths, we perform most of our examinations on a 3T scanner (Trio, Verio, Skyra; Siemens, Erlangen, Germany) due to the superior SNR and contrast. 3T imaging provides high-quality 2D and 3D imaging, essential for the optimal evaluation of the complex anatomy, frequent variations, and small size of the brachial plexus segments (Fig 1). T1-weighted images are most useful for anatomy of the nerves, surrounding fat planes, scalene and regional muscles, and the thoracic outlet. T2-weighted images are obtained with a variety of contrasts (fat-suppressed T2-weighted/STIR) for optimal assessment of the brachial plexus. Sagittal STIR imaging is useful for individual-segmental assessment of the nerve segments. STIR imaging has multiple advantages, such as depiction of symmetric normal hyperintensity and size characteristics of the dorsal nerve root ganglion at multiple levels on the same image for comparison. The nerve roots can be followed throughout their course from their origin to the terminal segments of the brachial plexus, and any relative change in signal and morphology among ipsilateral and contralateral respective nerve can be easily identified. Relative identification of trunks and cords is facilitated by their relationships to the subclavian and axillary arteries, respectively; and finally, the intramuscular course of the nerves through the scalene muscle is nicely depicted as a step-off in the normal smooth course. MRN technique. 3T MR neurography imaging sequences with isotropic multiplanar reconstruction. 3D T2 SPACE with multiplanar reconstruction of the cervical spine (medium arrows). Axial T1-weighted image shows the bilateral brachial plexus through the lower aspect of the scalene triangle (small arrows). Coronal MIP 3D STIR SPACE image shows the brachial plexus (thick arrow). Sequential sagittal STIR images show the normal and symmetric C5-T1 nerve roots (curved arrows), trunks (circle), and cords (oval). The 3D STIR SPACE sequence allows excellent background fat suppression and isotropic multiplanar and curved planar reconstructions. The reconstructed images can be further enhanced with MIP to highlight the imaging abnormality and for depiction along the longitudinal plane of the nerve. With current 3T magnet strength and flex coils, SNR decreases near the shoulder point on high-resolution 3D images if both sides are imaged together. Therefore, if a unilateral abnormality is suspected in the distal segments (cords) of the brachial plexus, ipsilateral 3D imaging focused to that area should be performed (Fig 2). Sagittally acquired STIR images often circumvent this limitation. Normal brachial plexus. Coronal MIP 3D STIR SPACE image focused on the left side shows the anatomy of the brachial plexus (arrows). Nerve findings include asymmetric T2 hyperintensity; enlargement; kinking of nerves by fibrosis/flattening by intramuscular course/entrapment by the mass lesions; and discontinuity/focal neuroma formation in injury. Sometimes, it may be difficult to differentiate stretch injury/brachial plexitis–related T2 signal and size abnormalities of the nerve roots from underlying long-standing cervical spondylotic changes in middle-aged and elderly subjects, especially if no prior comparison study is available. Generally, asymmetric T2 hyperintensity in the scalene triangle, sparing the most proximal segment of the nerve root and dorsal nerve root ganglion, usually distinguishes brachial plexopathy from cervical spondylosis–related nerve impingement/irritation, which involves the most proximal portion of the nerve within and immediately distal to the neural foramen; additionally, the abnormality in the latter case is usually restricted to the nerve corresponding to the most narrowed foramen (Fig 3). Isolated C6 radiculopathy. A 51-year-old woman with right arm pain and a tingling sensation, clinically suspected of having brachial plexitis versus radiculopathy. Sagittal STIR (A), axial T2 SPACE (B), and coronal 3D MIP STIR SPACE (C) images show an asymmetrically hyperintense and diffusely enlarged isolated C6 nerve root (arrows), corresponding to the markedly narrowed right C6 neural foramen. The findings are in keeping with cervical radiculopathy, in the setting of cervical spondylosis. The most common cause of injury is motor vehicle crashes with or without fractures and dislocations of the cervical spine, or obstetric injuries. Other etiologies include sports injury, gunshot wound, rucksack injury, and iatrogenic traction injuries during anesthesia. From a surgical and prognostic point of view, the injuries are classified into 3 categories: preganglionic (Fig 4), postganglionic, and a combination of both. It is important to carefully look for the nerve roots from the spinal cord to the extraforaminal location because nerve root avulsion requires a major procedure, neurotization. Postganglionic lesions are further classified into lesions in continuity (requiring rehabilitation/neurolysis) and nerve discontinuity (requiring nerve repair/grafting). The overall spectrum of injuries ranges from neuropraxia/stretch injury (most common) to axonotmesis, partial neurotmesis with neuroma in continuity formation to complete nerve lacerations (neurotmesis)/nerve root avulsions, the latter being the most severe injury. These injuries may concomitantly affect various upper limb nerves, such as the suprascapular, musculocutaneous, and axillary nerves. Nerve root avulsion. A 22-year-old man after a motor vehicle crash and ulnar-sided arm weakness. Axial T2-weighted (A) and coronal MIP 3D STIR SPACE (B) images show the avulsed left T1 nerve root (large arrows) and C8 nerve root (small arrow) with pseudomeningocele formation. Stretch injury with suprascapular neuropathy. A 48-year-old man after a recent motor vehicle crash. Sequential sagittal STIR images (A and B) show asymmetrically enlarged and hyperintense C5 and C6 nerve roots (large arrows in A) relative to other normal nerve roots (small arrows). All the nerve segments are in continuity. Notice the hyperintense suprascapular nerve (large arrow in B) and mild denervation edema of the supraspinatus and infraspinatus muscles (stars). Multiple acute nerve root avulsions. A 51-year-old man with loss of function in the left upper extremity due to recent motor vehicle crash. Coronal MIP 3D STIR SPACE (A) and sagittal STIR (B) images show avulsed C6, C7, and C8 nerve roots (arrows) with abnormal morphology due to hemorrhage and edema from a recent injury, obscuring clear details of the nerve roots. Notice the normal C5 nerve root (large arrows in A) and the normal T1 nerve root (small arrow in B). Neurotmesis. 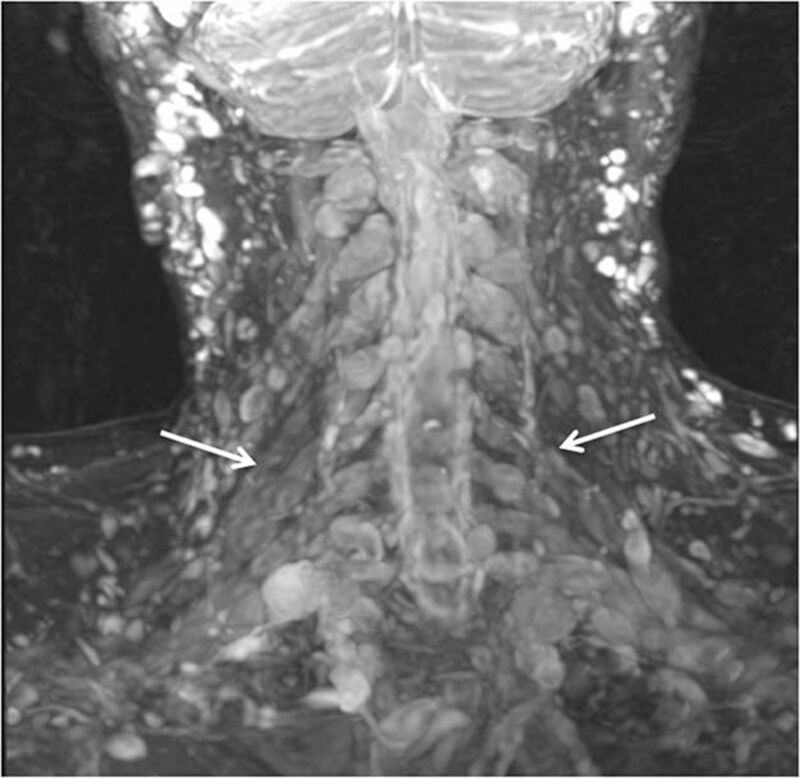 A 43-year-old woman with loss of function in the left upper extremity following recent neck surgery. Coronal MIP 3D STIR SPACE image shows severed, enlarged, and hyperintense C5 and C6 nerve roots with distal end bulb neuromas (arrows), just proximal to the formation of the left upper trunk. The findings were confirmed on re-exploration, and the patient underwent immediate nerve transfer. Kinnier Wilson first described TOS in 1900 as a syndrome involving compression of a neurovascular bundle passing between the anterior scalene and middle scalene muscles. There are various types of TOSs: disputed (most common), vasculogenic (arterial, venous, or both), true neurogenic (nerve), combined (neurovascular), and droopy shoulder syndrome.18,19 Disputed form presents with only sensory symptoms and is considered a controversial entity. Vasculogenic TOS occurs most commonly in young athletes with frequent hyperabduction or overhead activities, due to compression of axillary or subclavian vessels. The compression may be static or dynamic (positional) and may result in stenosis, thrombosis, and aneurysm formation (also referred to as the Paget-von Schrotter syndrome). Shoulder and arm pain with swelling and discoloration/temperature changes of the affected hand are possible symptoms. True neurogenic TOS (Gilliatt-Sumner hand; minority of TOS cases) usually results from compression of the lower trunk of the plexus by anatomic variations as described above. It is more common in women and presents with medial arm pain and ulnar-sided hand and forearm sensory dysfunction (tingling) and weakness (Fig 8). Droopy shoulder syndrome is also common in young women presenting with shoulder pain and paresthesias. On radiographs, the second thoracic vertebra may be seen on the lateral view. Drooped shoulders are usually bilateral and may cause stretching of the brachial plexus segments. Other subjects likely to develop TOS are those who have neck injuries from traffic collisions and those who use computers in nonergonomic postures for extended periods. The diagnosis of TOS is traditionally based on results of clinical evaluation, including various dynamic maneuvers such as elevation of the arm. However, diagnosis based on clinical examination alone is often difficult. Additionally, the proximal location of the nerve roots and subtle demyelinating changes developing in the initial stages of the disease limit the ability of an electromyographer to detect mild or early TOS. TOS with C8 neuropathy. A 17-year-old girl (trumpet player) with left arm and hand weakness in an ulnar distribution, exacerbated by shoulder abduction. 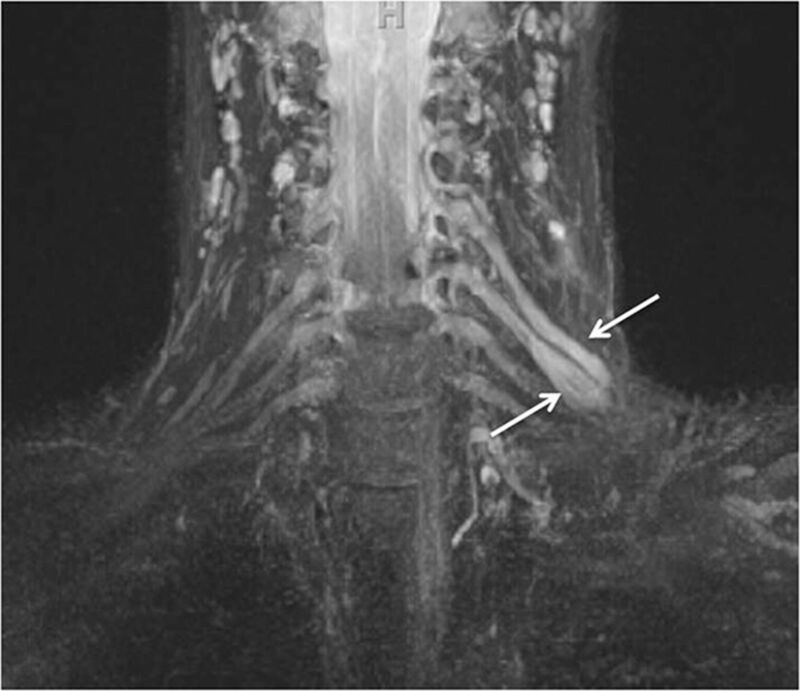 Sagittal STIR (A) image shows an asymmetrically enlarged and hyperintense C8 nerve root (large arrow) compared with the other normal nerve roots (small arrows). Notice minimal asymmetric hyperintensity of the T1 nerve root, a common nonspecific finding. 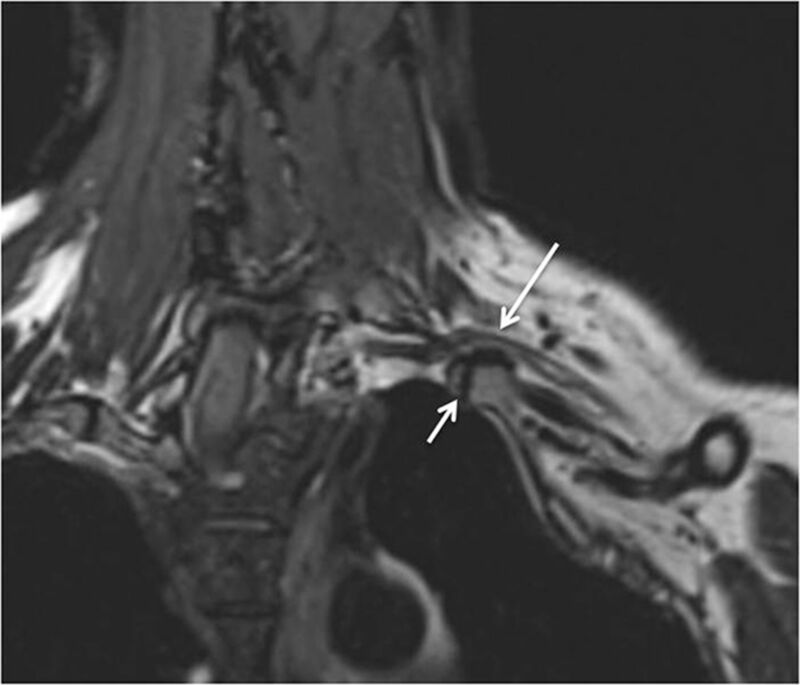 Axial T1-weighted (B) MR image through the lower neck shows a prominent flow void (curved arrow) indenting the left C8 nerve root (large arrow). The EMG findings were normal in this case. On surgery, the flow void turned out to be a prominent branch of the left thyrocervical trunk, which was ligated. C8 neurolysis was also performed. The patient's symptoms completely resolved following surgery. As mentioned above, minimal T2 hyperintensity of the C8 and T1 nerve roots is commonly seen as a nonspecific finding; altered T2 signal intensity extending into the lower trunk or associated nerve enlargement or both generally correlate with clinical findings of TOS. Although uncommon, involvement of the middle trunk or kinking of the nerve roots by a fibrous band or flattening due to an intramuscular course of the nerve roots, impingement by anomalous vessels, narrowing of the interscalene space by a hypertrophied muscle, or cervical ribs or costocostal pseudoarthrosis impinging the nerves may be seen as abnormal findings (Fig 9).4,18,20⇓⇓–23 Simultaneous depiction of the causative lesion, such as a cervical rib and associated displacement of the nerve with signal abnormality, is possible on curved reconstructions generated from isotropic 3D imaging (Fig 9). The treatment of TOS may be rehabilitation or surgery by anterior scalenectomy and anomalous rib resection. Although MRN is frequently used for presurgical planning, it may also preclude the suspected diagnosis of TOS, when it demonstrates a completely normal course and caliber for all nerve segments that are under suspicion, thereby presenting evidence against unnecessary surgery. A variant intermuscular course might not always be symptomatic (Fig 10). MRN is also useful for detection of focal fibrosis causing re-entrapment of the nerves, with persistent enlargement and T2 signal abnormality of the nerves in failed cases of thoracic outlet surgery. Thoracic outlet syndrome. A 55-year-old woman with weakness of the left upper extremity with tingling in the hand. 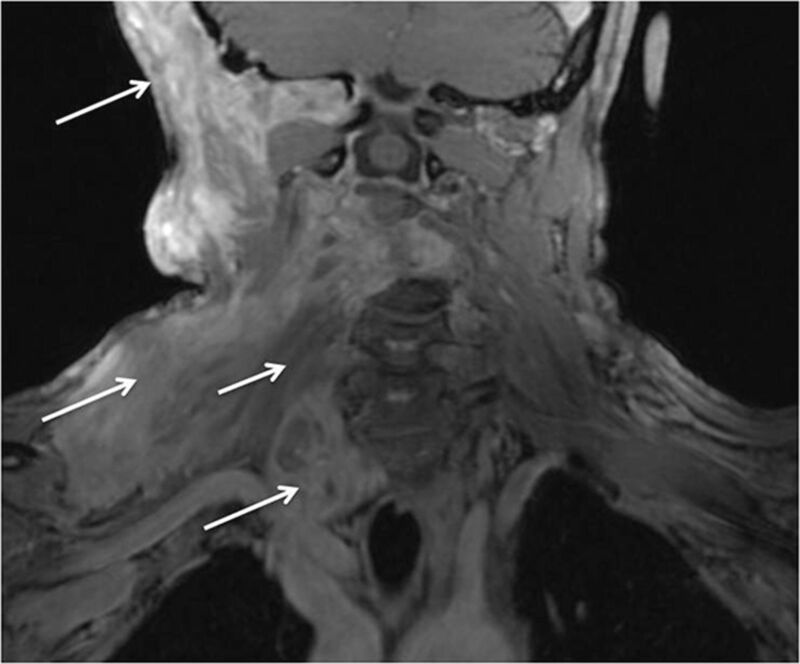 Coronal T2 SPACE image shows the deviated path of the C8 nerve root with abnormal flattening (arrow) due to pseudoarthrosis between the left cervical rib and first rib, which was subsequently proved on the surgery. The patient improved after surgery. Intramuscular course and entrapment of the C5 nerve root. A 48-year-old man after a recent motor vehicle crash. Sagittal STIR (A) and coronal MIP 3D STIR SPACE (B) images show the intramuscular course of the C5 nerve root with relatively anterior and lateral positioning and mild flattening (large arrow) compared with the other brachial plexus nerve roots (small arrows). The patient had no symptoms referable to TOS pathology. Various space-occupying lesions, such as hematoma, nerve sheath tumors, benign tumors, primary or secondary tumors of perineural spaces, and various tumor variants (diffuse polyneuropathies) may involve the different elements of the brachial plexus. Benign peripheral nerve sheath tumors include neurofibroma (unencapsulated, infiltrates the fascicles), schwannoma (encapsulated, displaces the nerve fascicles), and ganglioneuroma (an elongated lobulated lesion along the ganglion chain). The peripheral nerve sheath tumors show classic MR imaging signs of the split fat sign, target sign, fascicular sign, and tail sign. Malignant peripheral nerve sheath tumors occur less commonly, and these lesions are frequently large (>5 cm), present with worsening pain or new neurologic deficits (Fig 11), and demonstrate a heterogeneous appearance and enhancement. Current 3D MR imaging techniques, including contrast enhancement features, beautifully depict the lesion and its topographic characteristics; however, the imaging findings may not accurately indicate the benignity of the lesion. In the future, it is expected that diffusion tensor imaging will likely play a useful role in differentiation of these lesions by providing a functional insight into the lesions. Malignant peripheral nerve sheath tumor. A 56-year-old man with right shoulder and arm pain. 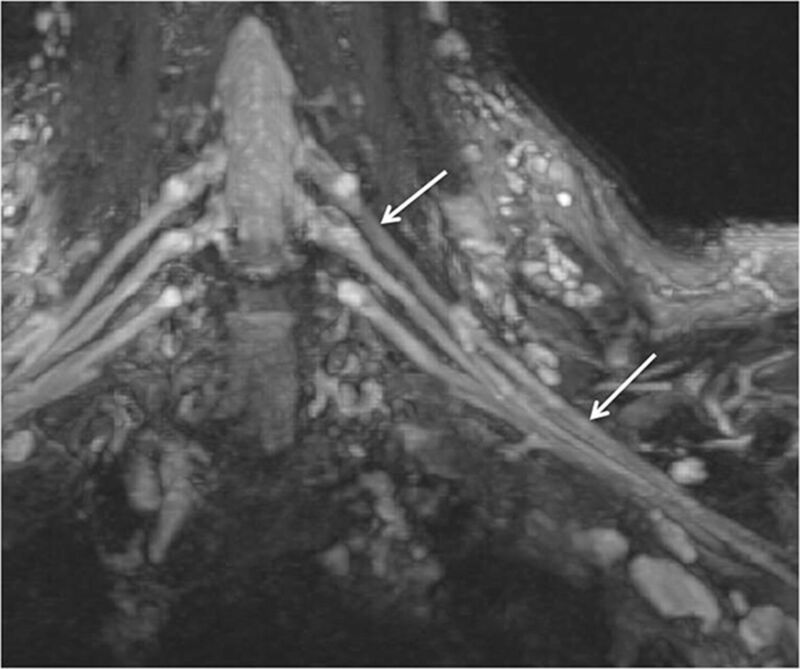 Coronal MIP 3D STIR SPACE image shows enlarged right C5 and C6 nerve roots and upper trunk (small arrows) with a surgically proved malignant nerve sheath tumor (large arrow). Lymphoma involving the terminal branches of the left brachial plexus. A 59-year-old man with left arm pain and weakness. Coronal MIP 3D STIR SPACE image shows mildly hyperintense peripheral nerve branches of the left brachial plexus (small arrows); distally encased by the B-cell lymphoma mass lesion (large arrow). Neurofibromatosis type 1. 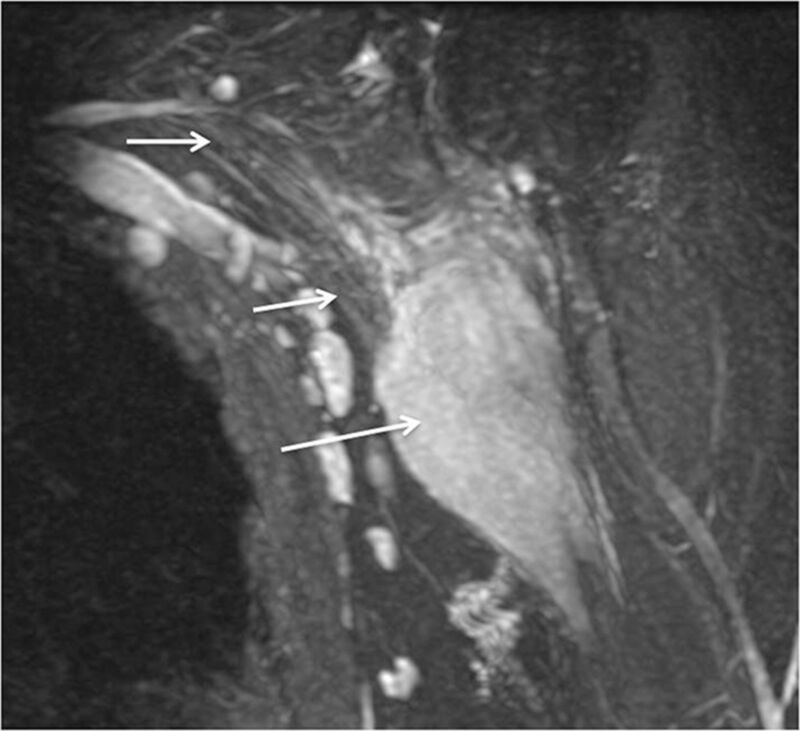 Coronal MIP 3D STIR SPACE image in a 24-year-old woman shows numerous cutaneous and subcutaneous hyperintense peripheral nerve sheath tumors along with diffuse nodular thickening of bilateral brachial plexus segments (arrows). Plexiform neurofibroma in neurofibromatosis type-1 (NF-1). A 36-year-old man with known NF-1 presenting with right shoulder and neck pain with weakness of the arm. 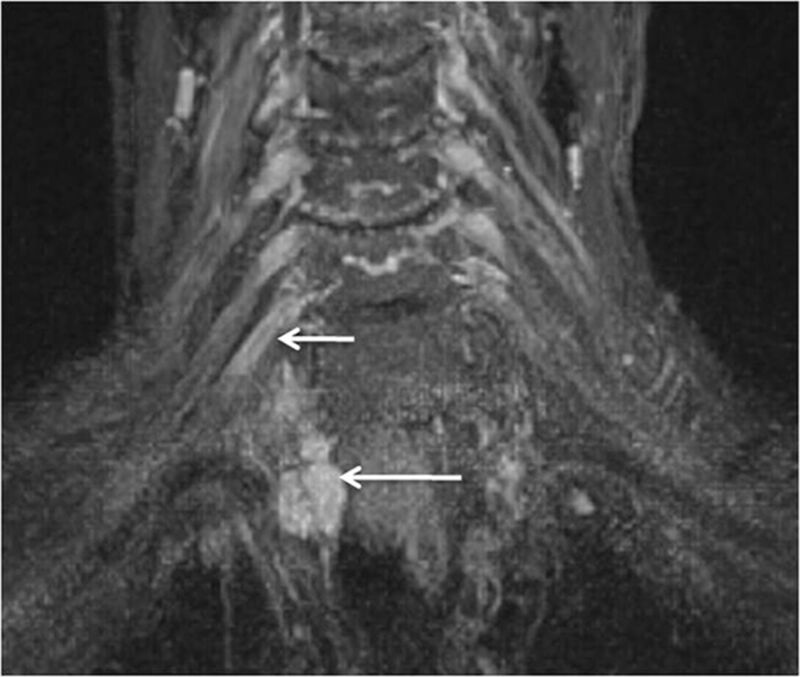 Coronal postcontrast fat-suppressed T1-weighted image shows a large infiltrative mass showing a “bag of worms” appearance (large arrows), encasing the brachial plexus (small arrow), in keeping with a plexiform neurofibroma. Lymphoma. A 65-year-old man with a history of lymphoma who presented with new-onset weakness of the right upper extremity. 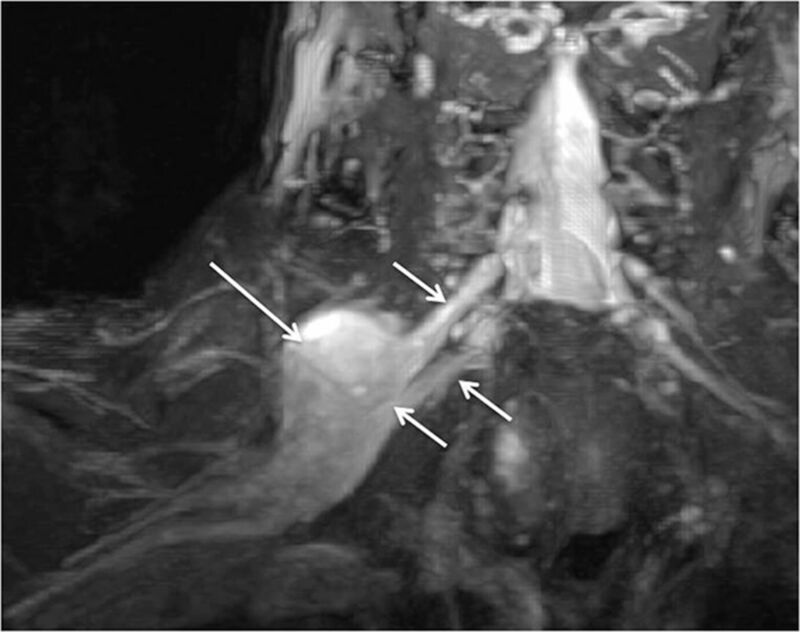 Coronal MIP 3D STIR SPACE (A) and sagittal STIR (B) images show fusiform enlargement of the right C7 nerve root (arrows) in keeping with lymphomatous involvement. Patients presenting with recurrent symptoms following radiation treatment for malignancy may have tumor recurrence or radiation plexopathy. Tumor recurrences usually occur within 1 year following the treatment and lead to lower supraclavicular plexus involvement (predominately C8, T1, and the lower trunk). Radiation plexopathy may occur from a few months to 20 years from the date of treatment (5%–10% incidence) and involves the infraclavicular plexus (Fig 16). Although symptoms of pain, paresthesias, and motor weakness can be seen in both scenarios, EMG shows characteristic myokymic discharges in approximately 30% of cases, usually not seen with tumor infiltration. MRN shows a focal or diffuse enhancing mass lesion in case of tumor recurrence, with asymmetric enlargement of the plexus (Fig 17).12,27 In postradiation patients, the abnormality is generally geographic in the radiation field and diffuse and symmetric without focal masslike enhancement on contrast examinations. Postradiation fibrosis may also be seen as T1 and T2 hypointense fat stranding with distortion and kinking of the nerve segments (Fig 16). Radiation plexopathy. A 67-year-old woman with a history of left breast carcinoma and radiation treatment 20 years ago who presented with weakness and pain in the left upper extremity. Coronal MIP 3D STIR SPACE (A) image shows diffusely enlarged and abnormally hyperintense left C8 and T1 nerve roots and lower trunk (arrows). Corresponding coronal fat-suppressed postcontrast T1-weighted (B) image shows no focal enhancement (arrows) to suggest recurrent disease. Axial non-fat-suppressed T1-weighted (C) image shows perineural radiation fibrosis encasing the left C8/T1 nerve roots and the lower trunk of the brachial plexus (arrows). Radiation neuropathy. An 81-year-old woman, previously treated for right breast carcinoma, who presented with right arm and neck pain. Coronal 3D STIR SPACE image shows a focal mass (large arrow) encasing the right T1 nerve root. Additionally, there are mild enlargement and hyperintensity of the right C8 nerve root (small arrow). Idiopathic brachial plexitis is seen with an incidence of 1.6/100,000. Proposed etiologies include immune versus inflammatory. It affects young and middle-aged patients, males more than females, and may be bilateral in up to 30% of patients. Patients present with sudden onset of severe constant pain in the neck, shoulder, or upper arm, which within a few weeks, is followed by profound weakness and atrophy of the regional muscles. The most frequently affected muscles are the serratus anterior, supraspinatus, and infraspinatus muscles. While multiple nerves may be affected, for unknown reasons, the ulnar nerve is rarely affected. MRN may show diffusely enlarged and hyperintense nerves and scattered muscle denervation changes around the shoulder joint (Figs 18 and 19).11,28,29 Treatment is pain control and rehabilitation. The therapeutic benefit of steroids is controversial. A, Brachial neuritis with long thoracic nerve neuritis. A 54-year-old man with right shoulder pain and right scapular winging for a few months. Coronal 3D STIR SPACE image shows the asymmetrically hyperintense and enlarged C7 nerve (large arrows). The abnormality extended into the middle trunk and its divisions (not shown). Notice normal left C7 nerve root (small arrows). Sagittal STIR (B) image shows the abnormally enlarged and hyperintense long thoracic nerve along its course (arrow). Axial STIR (C) image through the chest shows atrophy and edema like signal of the right serratus anterior muscle (small arrows). Notice the normal left serratus anterior muscle (large arrow). Brachial and axillary neuritis. A 43-year-old woman with right shoulder pain. Sagittal fat-suppressed T2-weighted image shows an abnormally hyperintense axillary nerve (small arrows) and denervation edema in the teres minor muscle (large arrow). The suprascapular nerve is a mixed motor-sensory nerve supplying the shoulder joints and the supraspinatus and infraspinatus muscles. It arises from the upper trunk of the brachial plexus and travels laterally in the posterior triangle of the neck to enter the supraspinatus fossa through the suprascapular notch of the scapula, which is covered by the transverse scapular ligament. This fibro-osseous tunnel makes it vulnerable to entrapment due to mass lesions such as paralabral cysts, varicosities, variant ligaments or muscle insertions, rotator cuff tears, and tumors. It courses posteroinferiorly, passing through the spinoglenoid notch to reach the infraspinatus fossa. It supplies the supraspinatus muscle at the suprascapular notch and the infraspinatus muscle distally. Therefore, if a compressing lesion is located around the suprascapular notch, both the supraspinatus and the infraspinatus muscles are denervated. When a compressing lesion is located around the spinoglenoid notch, only the infraspinatus is denervated. Patients may present with shoulder pain and weakness in abduction (supraspinatus) and external rotation (infraspinatus). EMG may confirm the nerve abnormality. On MRN, the normal suprascapular nerve is generally not seen, while in abnormal cases, the nerve can be seen throughout its course and its continuity; entrapment by a mass lesion and regional denervation muscle change are evident. In brachial plexitis cases, MRN shows the abnormal nerve and coexistent brachial plexus abnormalities involving C5, C6, and the upper trunk in variable combinations (Figs 5 and 20).11 Treatment is rehabilitation versus surgical neurolysis and release of the transverse scapular ligament. Neurotmesis with suprascapular nerve severance and axillary neuropathy. A 46-year-old man with a dirt bike injury. Coronal MIP 3D STIR SPACE (A) image shows complete disruption of the left C5 and C6 nerve roots (arrows), proximal to the formation of the upper trunk. Sagittal STIR (B) image shows an enlarged and hyperintense suprascapular nerve proximal to its disruption (large arrow). Also note hyperintense trunks of the brachial plexus (small arrows). 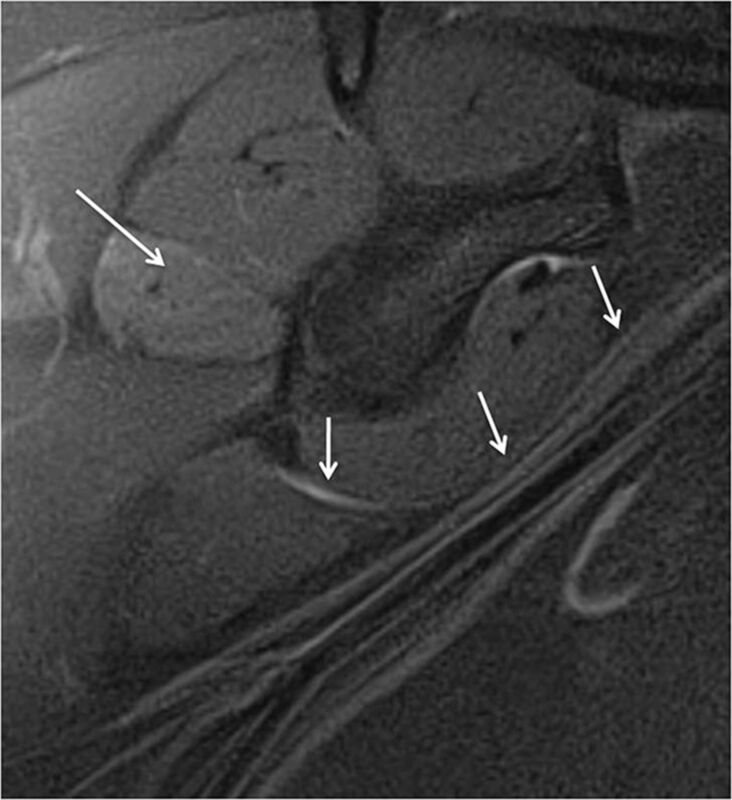 Further lateral sagittal STIR (C) image shows denervation changes in the rotator cuff (small arrows) muscles (C5 and C6 distribution) and an abnormally hyperintense but continuous axillary nerve (large arrows). The axillary nerve is a mixed motor-sensory nerve, which arises in the axilla from the posterior cord of the brachial plexus. The nerve fibers originate from the C5 and C6 roots, middle trunk, and its posterior division. The fibers continue to contribute to the upper trunk and posterior cord to finally form the axillary nerve. The axillary nerve courses through the axilla anterior to the subscapularis muscle and behind the axillary artery to the inferior aspect of the shoulder joint along with circumflex humeral vessels to terminate in the quadrilateral space. After exiting the quadrilateral space, the nerve finally terminates in anterior, posterior, and collateral branches to the long head of the triceps muscle. The anterior or upper branch winds around the surgical neck of the humerus and terminates after supplying the deltoid muscle and adjacent skin. The posterior or inferior branch supplies the teres minor, posterior belly of deltoid muscle, and adjacent skin. The musculocutaneous nerve is a mixed motor-sensory nerve, which arises from the lateral cord of the brachial plexus at the lower border of the pectoralis major muscle. Its fibers originate from the C5, C6, and C7 nerve roots. It travels through the axilla and penetrates the coracobrachialis muscle and then passes between the biceps and brachialis muscles. Just above the elbow, it pierces the deep fascia lateral to the tendon of the biceps and continues as the lateral cutaneous nerve of the forearm. It innervates the coracobrachialis, biceps, and brachialis muscles. A, Stretch Injury to right sided brachial plexus. Coronal 3D STIR SPACE (A) image shows diffusely enlarged right sided brachial plexus (large arrows) following a recent clavicular fixation for fracture. Notice normal left brachial plexus (small arrows). The patient improved over a few months of expectant treatment. B and C, Stretch injury of the C6 nerve root and musculocutaneous nerve. A 60-year-old man with weakness of the right biceps and brachialis muscles following a recent injury. Axial T2 SPAIR (B) image through the proximal right arm shows an abnormally hyperintense and enlarged musculocutaneous nerve (large arrow) with denervation changes in the biceps and brachialis muscles (small arrows). The long thoracic nerve is a motor nerve with a single muscle supply and is a proximal branch of the brachial plexus that is formed by C5, C6, and C7 nerve roots. It originates from the posterior aspect of the plexus and passes through the middle scalene muscle. It then courses along the chest wall on the outer surface of the serratus anterior muscle, innervating the muscle along its path. The nerve can be injured by traction from a fall, a motor vehicle crash, axillary lymph node dissection, mastectomy, or sports injury, or it may be entrapped within the middle scalene muscle or by a chest wall mass. It is also the most common nerve involved with brachial plexitis (Fig 18). Patients present with dull shoulder pain and a laterally winged scapula with weakness in overhead arm activity (ie, raising the arm in front of the body). The diagnosis can be confirmed by an EMG of the serratus anterior muscle. Because the nerve is very small and difficult to see on MRN, the role of imaging is to confirm the respective muscle denervation changes in a clinically confusing case.2 An abnormal nerve may be occasionally seen on MRN along with denervation changes in the serratus anterior muscle. Another important role of imaging is to exclude a neoplasm in a patient without a history of trauma or brachial plexitis. Treatment is rehabilitation or surgery. The brachial plexus is anatomically complex and may be involved in a variety of pathologies, leading to significant morbidity. MRN plays a significant role in the diagnostic algorithm of plexus pathologies, aiding in early diagnosis and patient management. Disclosures: Avneesh Chhabra—RELATED: research grants from Siemens AG and Integra Life Sciences and the support of a GE-AUR Fellowship, UNRELATED: Consultancy: Siemens, Comments: MSK CAD system development, Travel/Accommodations/Meeting Expenses Unrelated to Activities Listed: Siemens, Integra, GE-AUR. John A. Carrino—grant from Siemens Medical Systems to study MR neurography, UNRELATED: Consultancy: Quality Medical Metrics, Grants/Grants Pending: Toshiba Medical. Filippo Del Grande—institutional grant from Siemens, UNRELATED: Stock/Stock Options: GE Healthcare, Comments: shareholder of approximately $6100.